Press TV, Jerusalem - Israeli authorities have banned two senior Muslim clerics of the al-Aqsa Mosque in the occupied Old City of East Jerusalem al-Quds from entering the holy site for one week. 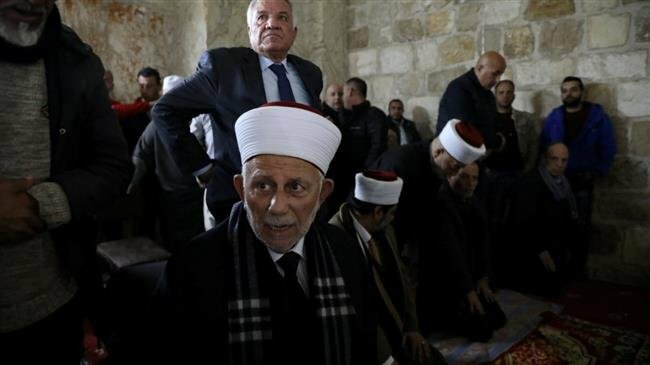 Sheikh Abdel-Azeem Salhab, the head of the Waqf Council appointed by Jordan to oversee the Islamic sites at the sacred compound, and his deputy, Sheikh Najeh Bkerat, were initially arrested at their homes by Israeli forces in pre-dawn raids on Sunday. Hours later, the clerics were released under the condition of not entering the al-Aqsa Mosque compound for a week, Palestinian Ma’an news agency reported. Both clerics had had important roles in reopening a gate leading into the Bab al-Rahma Mosque on Friday, when hundreds of Muslims held prayers for the first time in 16 years. The mosque had been sealed by Israeli authorities. Bab al-Rahma, with a gate of the same name, consists of a large building and a courtyard that lie east of the 35-acre sacred al-Aqsa Mosque compound. Inside the compound are the two Muslim holy shrines of the Dome of the Rock and the al-Aqsa Mosque. The Bab al-Rahma Mosque was sealed by Israeli authorities in 2003 after they claimed it was being used by Palestinians for political activities. Israeli authorities renewed the restriction order annually until an Israeli court ordered the building closed until further notice in 2017. Israeli police also released at least three Palestinian activists later on Sunday after detaining them in the morning for paving the way for worshipers to enter the mosque. Furthermore, Israeli police threatened on Sunday to carry out more detentions in the upcoming few days over the same matter. Separately on Sunday, Israeli authorities also handed an order to another Waqf official, Sheikh Raed Daana, banning him from entering the al-Aqsa Mosque compound for six consecutive months. The reason for the ban was not clear. The reopening of the Bab al-Rahma Mosque followed days of tension between Israeli forces and Muslim religious authorities over access to the compound. The al-Aqsa Mosque compound is a flashpoint, highly respected by Muslims, Jews, and Christians alike. The mosque is Islam’s third holiest site after Masjid al-Haram in Mecca and Masjid al-Nabawi in Medina.